CHARLOTTE, North Carolina, July 4, 2012 (ENS) – Four airmen from the North Carolina Air National Guard were killed and two others were seriously injured when a plane equipped with a firefighting system crashed Sunday evening while battling a woodland wildfire in South Dakota. The airmen belonged to the 145th Airlift Wing, North Carolina Air National Guard, based in Charlotte. They were aboard a C-130 plane fitted with a Modular Airborne Fire Fighting System, MAFFS, according to the North Carolina Air National Guard. MAFFS is a joint Department of Defense and U.S. Forest Service program that provides additional aerial firefighting resources when commercial and private air tankers are no longer able to meet the needs of the Forest Service. All of those killed were from North Carolina. Dead are Lt. Col. Paul K. Mikeal, 42, of Mooresville; Maj. Joseph M. McCormick, 36, of Belmont; Maj. Ryan S. David, 35, of Boone; and Senior Master Sgt. Robert S. Cannon, 50, of Charlotte. Both of the injured airmen remain hospitalized; their names will not be released. The crew and its aircraft along with two other 145th C-130s and three dozen airmen flew from Charlotte to Peterson Air Force Base in Colorado Springs, Colorado, Saturday to assist with fighting forest fires in the Rocky Mountain region. They were due to move to a base in Cheyenne, Wyoming, on Monday. The crash occurred around 6:30 p.m. mountain time near Edgemont, South Dakota, as the crew assisted with battling the White Draw fire. The cause of the crash is unknown and is under investigation. North Carolina Governor Bev Perdue ordered flags to be flown at half staff Tuesday and President Barack Obama expressed condolences honoring the dead airmen. MAFFS missions were grounded on the weekend as authorities investigated the crash. The Commander of North American Aerospace Defense Command and the U.S. Northern Command announced that the MAFFS fleet resumed operations Tuesday in support of the National Interagency Fire Center and its firefighters on the front lines in several states. On Tuesday, the C-130 MAFFS completed 16 air drops on the Squirrel Creek fire in Wyoming, releasing some 41,250 gallons of fire retardant. “The support of civil authorities during natural disasters is a key and unique mission of the National Guard,” said Army Maj. Gen. Gregory Lusk, the adjutant general of the North Carolina National Guard. “The MAFFS mission is probably one of the seminal missions of the Air National Guard, representing interagency coordination between the Guard and the U.S. Forest Service, the Department of Homeland Security, and Department of Defense organizations to suppress the fires,” said Lusk. 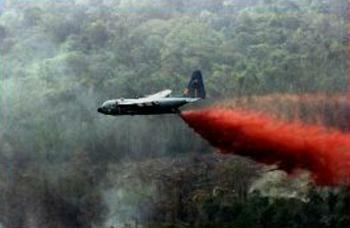 According to Forest Service records, the agency has been working with the North Carolina Air National Guard on fire suppression missions since the early 1970s. Firefighters, in the face of adverse weather and difficult terrain, continue to combat the 18,247 acre Waldo Canyon fire, now about 80 percent contained. More than 1,280 federal, state and local firefighters, more than 40 fire engines and four helicopters are battling the blaze today in the hillsides west of Colorado Springs. Started June 23, the Waldo Canyon fire has claimed two lives, destroyed hundreds of buildings and forced the evacuation of at least 34,000 area residents. To date, it has cost $13.6 million to contain. As the Waldo Canyon Fire becomes more contained, crews and equipment are being staged to respond to other wildfires across the region.